Other than with free machine embroidery, and sometimes even then, you’re probably going to need to transfer your embroidery design to fabric. There are a wide range of techniques you can use for this; some are useful for a variety of different applications, while others are more suited to particular techniques. 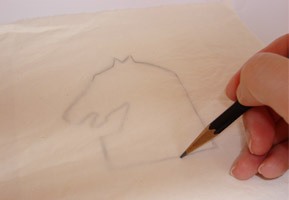 Using masking tape, tape your design to a light box or a white or pale surface, such as a light wood table or white card. Position your fabric over it, right side up, carefully aligning it to where your finished work is to go. You can hold it in position if it’s a small, simple design, but if it’s more complex you may want to consider taping your fabric in place with the masking tape too. Masking tape is easier to remove than Sellotape or Scotch tape and leaves less sticky residue, but even so, if using it, make sure that you only use it to stick down the edges of your fabric that you can afford to cut away if necessary. Dressmaker’s carbon paper works in the same way as the old-fashioned sort used with stationery, but tends to be on heavier paper, less likely to tear when pinned. It’s also available in different colours, commonly blue, orange and white, and so can be used with both dark and light fabrics. 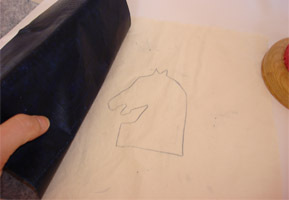 To use, place the carbon paper onto the right side of your fabric, with the coloured, carbon, side down. Place your design on top, and draw over it using a pencil or ball-point pen. You need to make sure that neither the design or the fabric shifts while doing this; commonly, all three layers (fabric, carbon paper and design) are pinned together, though in some cases you may wish to use masking tape. Try not to lean or rub on the paper while drawing round your design as this can lead to smudges of the carbon marking your fabric. As with pencil, this will leave a permanent mark that will need to be covered with stitching. 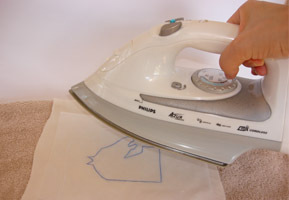 As well as using commercially-available iron-on transfers, it’s possible to make your own using a transfer pencil. As they’re invariably dark blue or red, they only work well on a pale coloured fabric. 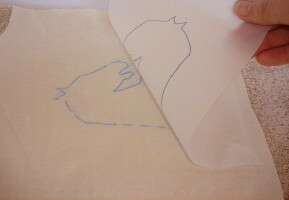 Place the tracing paper onto your fabric, right sides together, i.e. with the traced design down. This means that the version of the design that will be transferred to the fabric will be a mirror-image of your original design. Bear this is mind when marking it up! 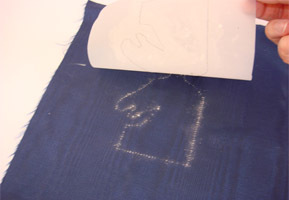 Attach the tracing paper to the fabric with pins or tacking (basting) stitches, and press hard with a hot dry iron. 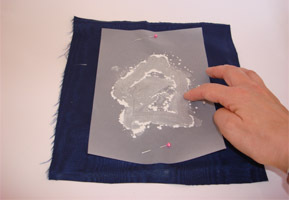 The transfer image will melt and stick to the fabric. This process may take a little time, but don’t keep the iron on one place too long or you may scorch the fabric. Once the transfer has been taken off the fabric it’s very difficult to line it up correctly for another go, so make sure the design has transferred properly before removing it. Any faint lines can be drawn over with pencil. 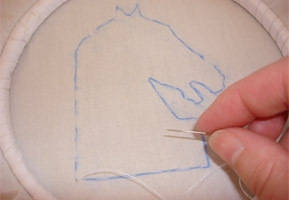 The transfer outline can be removed by washing, but if the finished piece is not to be washed, again make sure that the outline is covered by stitching. The prick and pounce method of transferring a design to fabric is an ancient one, having been used throughout the Medieval period and before. While now mostly superseded by other more convenient methods, it still works, and is very useful for transferring large designs in one go where transfers, carbon paper, etc. aren’t practical. 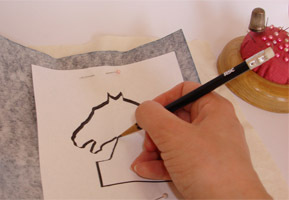 Using a sharp needle, prick holes in the paper design around the lines to transfer. These should be quite close together to avoid a confusing game of join-the-dots later on. 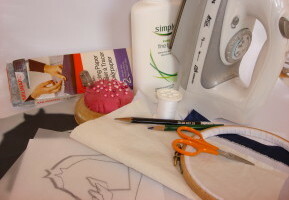 Place the design on a cutting mat or card while doing this to prevent any damage to a table or yourself. Depending on the complexity of your design, you can also use special pricking wheels or a sewing machine with no thread to create the holes. Position the pricked-out design on your fabric and pin in place. Rub a fine powder, or “pounce”, over the design so that it goes through the holes and onto the fabric. The colour of the fabric will determine the colour of the pounce – the most commonly used is white, either powdered chalk, corn flour, baby powder or similar, though for pale coloured fabrics where this doesn’t show up sufficiently, blue powder is also available. If the pricked holes were close enough together, the design should be clear enough to be used immediately, but if necessary, carefully draw over any unclear areas with a pencil. Most methods of transferring a design require the fabric to be worked to be marked up directly, whether with a pencil, disappearing ink pen, transfer, carbon paper or pounce powder. In all these cases it’s possible to get marks you didn’t intend on your fabric, whether smudges or lines that went astray. 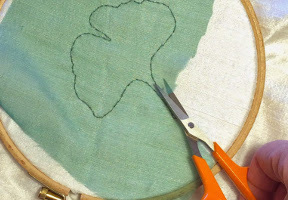 Often, this does matter too much as you’re covering the affected area with stitching or appliqué anyway, but on other occasions it can be a real problem. One solution is to use a two-stage process where the design is transferred onto a backing or lining fabric first, and then stitched onto the final top fabric. 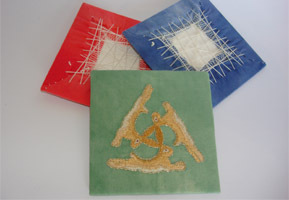 Using the method of your choice, transfer your design to a backing fabric. This is commonly a plain fabric in a neutral colour, such as linen, calico, cotton lawn, or even cotton muslin for fine work. With your design on the back of the backing fabric, attach your fine fabric to its front, with the two pieces of fabric back to back. 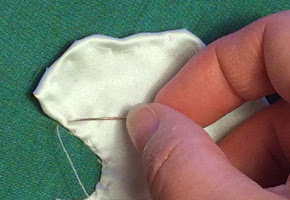 Pinning or tacking (basting) may be sufficient, or you can stitch it more firmly using herringbone stitch or similar or by using an overlocker to stitch both fabric pieces together. 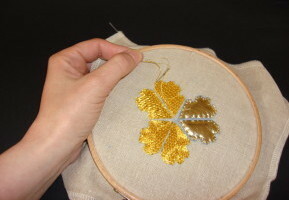 Using small running stitches, sew over the design on the backing fabric with ordinary sewing thread, in a colour that will blend in with the completed embroidery. 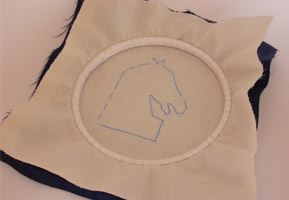 This process is a lot easier and neater if the joined fabrics are mounted in an embroidery hoop or frame. 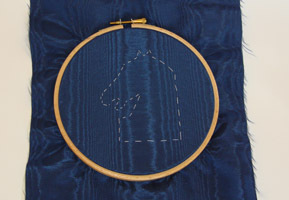 Any running stitches that are still visible when the embroidery is completed can be carefully unpicked, leaving no trace of the marked up design. It’s important to remember that the design tacked through the to the front of the top fabric will be a mirror-image of the design on the back of the backing fabric. 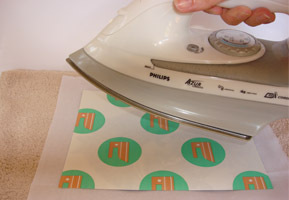 If using an iron-on transfer, this can actually be a good thing as it puts the final mark-up the right way round again without needing to reverse the original design. 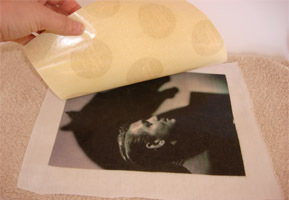 It’s possible to transfer photographs or other digital images onto fabric, using specialist papers or pastes. This can be done by using iron-on transfer papers designed for use with ink-jet printers. Simply print your design onto the special paper, cut to shape, place it onto your fabric with the printed side down, and press with a hot iron. It’s common for an image on the back of the paper to change when the correct temperature has been reached. Photocopies can also be used, by coating the photocopy – colour or black and white – with a special paste and applying it to the fabric, coated side down. Once dried, the copy paper and any remaining paste can be removed, leaving your image behind. In both cases, your fabric should be washed and dried first, to remove any surface preparation added during the manufacturing process that may prevent the transfer from sticking. You should also remember that the ironed-on version of your image will be a mirror image of the original, so be careful to make your transfer the reverse of how you want the finished piece to appear. Once the image has been transferred to your fabric, wash it again at a low temperature to remove any residue. You can now embellish the image with the embroidery technique of your choice.